I picked up this Kenner reference photo of artwork for an unproduced Joker "I-Scream" Machine vehicle awhile back. This toy obviously didn't make it into production, but the artwork shows how cool it might have been if it had! The vehicle would have appeared as an innocent ice cream wagon in "standard" mode, complete with umbrella and "happy clown" face up front. 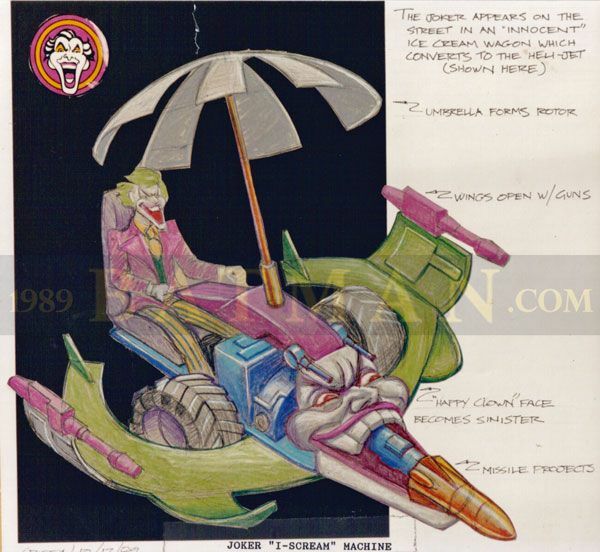 Once the sides open up though, the wagon switches into "Heli-jet" mode, with the umbrella becoming a rotor and the clown face morphing into Joker's visage.